The Disobedient Objects exhibition is on display at the Victoria & Albert (V&A) Museum, London, until 1st February 2015. It narrates at least one hundred years of world history to remind us that in the multitude of global societies, one phenomenon repeats itself without fail: some people in positions of power direct the cultivation of society to be divorced from the reality of ordinary people. With this backdrop, it sets out the principle that the power to change the course of human societies ultimately rests with ordinary individuals and not governments or policy-makers. Although this exhibition goes to calculated lengths to demonstrate that “many of the rights and freedoms we enjoy today were won by disobedience”*, this article examines the art-work of arpilleras (pronounced in Spanish as ar-pi-ye-ras), which toppled the Pinochet dictatorship in Chile in the 1980s. I had the treasured opportunity to hold a discussion with Roberta Bacic, a Chilean human rights researcher and curator whose collection of arpilleras is on display at the exhibition, and this article is based on Bacic thoroughly answering my questions during our meeting. The spread of socialist movements in the northern part of Latin America posed a threat to the capitalist USA, which plotted the establishment of Augusto Pinochet’s military regime in Chile in 1973 by overthrowing democratic rule. As part of the new dictator’s propaganda of power, deliberate cleansing of the male gender was carried out in different class hierarchies of the country: men were kidnapped, executed, jailed, tortured nd some times even thrown into the sea. Men and boys disappeared from their towns, and never returned; in a gender-imbalanced society where men held more social importance, their disappearances aimed to create an undeniable reality that no one is safe. 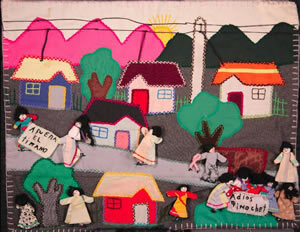 In the face of greatest adversity, an ever expansive creativity is born: this is what unfolded in Chile, as women carried out a nonviolent revolution by stitching the arpilleras with their stories sewn in the form of patch-work and dolls, and sent out their sorrow to distant shores through international organisations who sold these art-works. As I spoke to Bacic, she explained that whilst their hands were busy stitching, these women were surrounded in the safe company of each other and felt comfortable to weep or share their experiences. These gatherings for making arpilleras became the undercurrents of stitching demonstration against the regime, and also for stitching hope towards a secure future for their communities. ¡ADIÓS PINOCHET! (GOODBYE PINOCHET!) Chile, about 1980. Roberta Bacic Collection. Donation from Heidi and Peter Gessler, Switzerland. Photo Colin Peck. The arpillera titled ‘Goodbye Pinochet!’ (photographed above), attests to this phenomenon: whilst no one possessed the right to hold peaceful demonstrations, this work shows women carrying banners against the dictator on the streets and protesting. 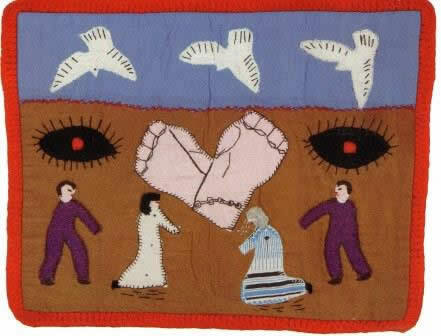 It was stitched not just in the traditional two-dimensional patch-work, but it used small dolls to represent the female protesters, to insist that even though they were under threat if they held demonstrations, their resistance will surge out from their art-works. ¿DÓNDE ESTÁN NUESTROS HIJOS? (WHERE ARE OUR CHILDREN?) Santiago, Chile, 1979. Roberta Bacic Collection. Donation from Jacquie Monty, England. Photo Martin Melaugh. The next arpillera, ‘Where are our children?’ (photographed above), was created by a woman whose child was abducted by the military; she stitched a pocket at the back of this art-work and left a hand-written letter for the stranger in a foreign nation who will buy it. The letter was this woman’s account of how children in her community have been taken away. The arpillera shows a weeping mother, chained hands, falling doves and penetrating eyes of secret police: it is a dramatic testimony to the kind of power that Pinochet wanted to establish in Chile. As I carefully looked at these arpilleras, I found the use of bright and bold colours to be compellingly moving. From where did these women find the hope to stitch in bright colours? How did they develop the resilience communicated in bold colours? If we are to engage in a dialogue to cultivate penetrating empathy for other cultures, then a critical starting point would be to understand people from their own interpretation of reality. It did not matter to Chilean women if creating these works would facilitate psychological healing processes, and perhaps it was insignificant. Given the sense of trauma and fear with which they lived, this process became their sole means to express their outrage and to protest. The bright and bold colours in the arpilleras were not hand-picked, they came from unused clothes in their homes, including the clothes of the disappeared men and children. The Pinochet dictatorship collapsed in 1988, and the arpilleras became an art of disobedience in neighbouring as well as in other countries of the world. Also on display in this exhibition is an arpillera from Colombia by the survivors of a massacre sponsored by their dictator over ten years ago, and an arpillera from Ireland that questions the USA’s use of their Shannon Airport for refuelling planes, which carry weapons and terror suspects who receive no legal representation before the extradition process.